A new context menu will be added to solution explorer which will allow file to be opened directly in the windows explorer. It will also have option to open the DLL file used for project reference. 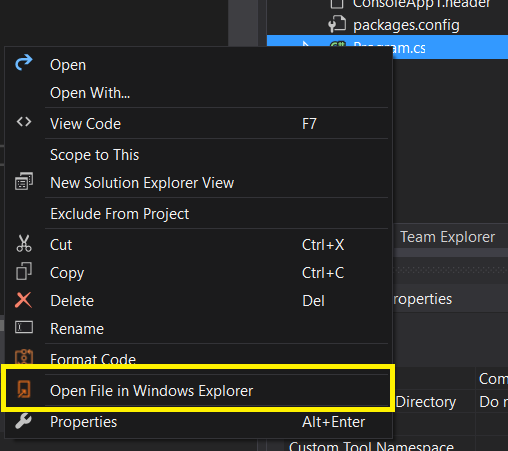 Open code file or reference in the windows explorer. Open File in Windows Explorer. New context menu will be added on to file node. Right click on the any file under solution explorer as shown below, then new command will be available which will open same file in the windows explorer. New context menu will be added on the reference node. Right click on the any reference in the project and you will get new option "Open Reference in Windows Explorer", once you click on this menu it will open the reference in the windows explorer.